The Invisible Man must have been a frustrating screen debut — discounting his small role in the silent British drama Build Thy House in 1920 — for Claude Rains. Although he’d bagged the title role, he’s only seen on screen for a few seconds at the end of the movie. At least his rich, distinctive voice is easily identifiable, and thus avoids any confusion about who’s talking when he’s speaks his lines. 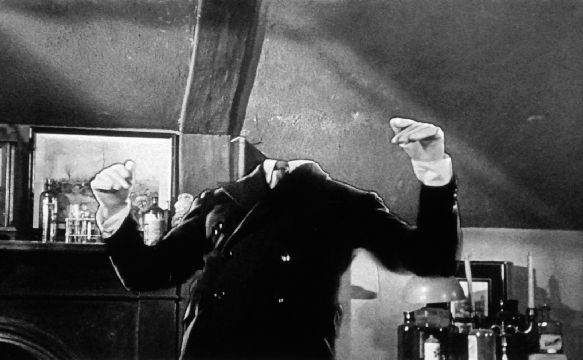 The Invisible Man came more or less slap bang in the middle of the first talking picture horror boom, which started in 1931 with Dracula and Frankenstein. Like both of those movies, this one was made by Universal Studios, who threw themselves into the genre with much more enthusiasm than the other major studios, and so the production values on this movie are pleasingly high. Rains plays Jack Griffin, who appears at a British pub one dark and stormy night with his head swathed in bandages and his eyes hidden behind dark glasses. He also wears gloves to hide his hands. Griffin is a scientist who has committed the most fundamental of errors: he’s used himself as a guinea pig in an experiment to make himself invisible before he’s developed the antidote for the effects of that experiment he has succeeded in making himself invisible before he figured out how to return to his normal state. What a bozo. Needless to say, Griffin’s not in the best of moods when he arrives at the inn, and requests a room where he won’t be disturbed. He’s come to the countryside to find some peace and solitude in which to carry on his research, but of course he didn’t allow for the fact that there’s not a lot goes on in sleepy British villages, and so his visit — and bizarre appearance — quickly pique the curiosity of the locals. So, the countryside turns out to be the worst place he could have chosen, and his funds run out before he has found the antidote. When the landlord and his shrewish wife (Una O’Connor, giving one of the shrillest performances of her career) cotton on to the fact that he’s penniless they demand he move out immediately, prompting Griffin, in a furious outburst, to remove his clothes and cause havoc through the village in his invisible state. It’s impossible for anyone to just disappear — literally or figuratively — without those they leave behind becoming a little curious, and while Griffin is leading the villagers in his new home a merry dance, his former colleagues are piecing together the nature of his work, which he kept closely guarded from them. In a cupboard Griffin used to keep locked, his boss Dr. Cranley (Henry Travers), who also happens to be the father of Griffin’s sweetheart, Flora (Gloria Stuart), finds a list of chemicals, one of which is a dangerous bleaching agent called monocaine, which can slowly drive its users insane. Cranley relays this information to his colleague Dr. Kemp (William Harrigan), who has wasted no time in attempting to replace Griffin in Gloria’s affections, so when Kemp hears a radio report that night about a case of mass hysteria in a village where the residents claim to have seen — or not seen, if you know what I mean — an invisible man he has a pretty good idea who is causing all that havoc. At just 71 minutes long, The Invisible Man wastes no time diving into the plot and chugs along at a fair old nip. The repeated switch from horror-thriller to comedy and back again gets a little wearing after a while, but there are plenty of good things to distract us, including tight direction from James Whale, who also directed the horror classics Frankenstein (1931) and The Old, Dark House (1932). The story takes place in a quaint Hollywood image of England, complete with rotund police constables sporting heavy moustaches, which the English-born Whale must surely have known was as far removed from the real England as an Arab with a camel. Considering the age of The Invisible Man, the special effects are incredibly good, with plenty of shots of objects floating around in mid-air with no visible means of support, including shirts and trousers worn by the invisible Griffin. These effects might not look like anything out of the ordinary by today’s standards but back in 1933 they must have blown contemporary audiences away.